Wise Registry Cleaner is a free and one of the safest Registry cleaning tools available in the market today. Its scanning engine is thorough, safe and fast. Wise Registry Cleaner cleans your computer from unwanted files. A clean machine leads to better computer performance. 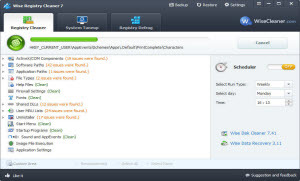 Wise Registry Cleaner is equipped with numerous tools to clean your system registry. A basic scan takes a look inside your registry. It cleans the files that can attribute to the slowness of your computer. Wise Registry Cleaner also support for registry defrag. Close all your running apps to obtain the optimum results.